Scans the input file for /ShieldingWall/xyz commands. Definition at line 60 of file QweakSimShieldingWallMessenger.hh. Definition at line 45 of file QweakSimShieldingWallMessenger.cc. References CollimatorWallDir, CollimatorWallMatCmd, CollimatorWallZPosCmd, DetectorHutDir, HideBackWall_Cmd, HideCollimatorWall_Cmd, HideFrontWall_Cmd, HideLeftWall_Cmd, HideRightWall_Cmd, HideTopWall_Cmd, ShowBackWall_Cmd, ShowCollimatorWall_Cmd, ShowFrontWall_Cmd, ShowLeftWall_Cmd, ShowRightWall_Cmd, ShowTopWall_Cmd, and VisibilityDir. Definition at line 123 of file QweakSimShieldingWallMessenger.cc. References CollimatorWallDir, CollimatorWallMatCmd, CollimatorWallZPosCmd, DetectorHutDir, HideBackWall_Cmd, HideCollimatorWall_Cmd, HideFrontWall_Cmd, HideLeftWall_Cmd, HideRightWall_Cmd, ShowBackWall_Cmd, ShowCollimatorWall_Cmd, ShowFrontWall_Cmd, ShowLeftWall_Cmd, ShowRightWall_Cmd, and VisibilityDir. Definition at line 152 of file QweakSimShieldingWallMessenger.cc. References CollimatorWallMatCmd, CollimatorWallZPosCmd, QweakSimShieldingWall::HideBackWall(), HideBackWall_Cmd, QweakSimShieldingWall::HideBeamLeftSideWall(), QweakSimShieldingWall::HideBeamRightSideWall(), QweakSimShieldingWall::HideCollimatorWall(), HideCollimatorWall_Cmd, QweakSimShieldingWall::HideFrontWall(), HideFrontWall_Cmd, HideLeftWall_Cmd, HideRightWall_Cmd, QweakSimShieldingWall::HideTopWall(), HideTopWall_Cmd, myShieldingWall, QweakSimShieldingWall::SetCollimatorWall_CenterPositionInZ(), QweakSimShieldingWall::SetCollimatorWallMaterial(), QweakSimShieldingWall::ShowBackWall(), ShowBackWall_Cmd, QweakSimShieldingWall::ShowBeamLeftSideWall(), QweakSimShieldingWall::ShowBeamRightSideWall(), QweakSimShieldingWall::ShowCollimatorWall(), ShowCollimatorWall_Cmd, QweakSimShieldingWall::ShowFrontWall(), ShowFrontWall_Cmd, ShowLeftWall_Cmd, ShowRightWall_Cmd, QweakSimShieldingWall::ShowTopWall(), and ShowTopWall_Cmd. Definition at line 72 of file QweakSimShieldingWallMessenger.hh. Referenced by QweakSimShieldingWallMessenger(), and ~QweakSimShieldingWallMessenger(). Definition at line 75 of file QweakSimShieldingWallMessenger.hh. 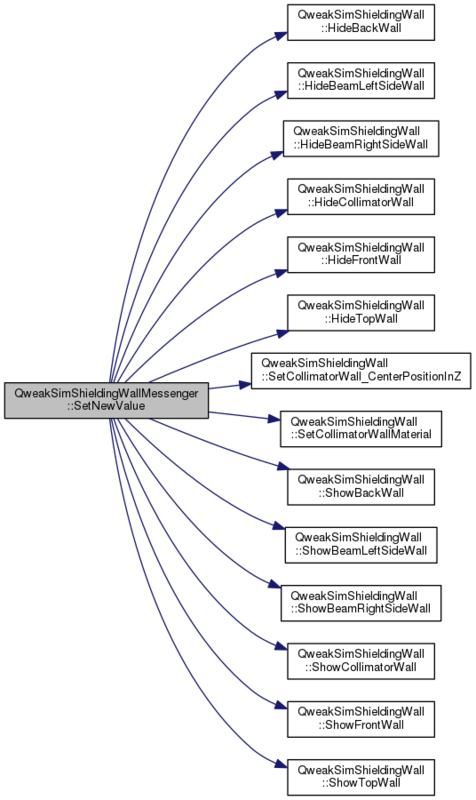 Referenced by QweakSimShieldingWallMessenger(), SetNewValue(), and ~QweakSimShieldingWallMessenger(). Definition at line 76 of file QweakSimShieldingWallMessenger.hh. Definition at line 71 of file QweakSimShieldingWallMessenger.hh. Definition at line 84 of file QweakSimShieldingWallMessenger.hh. Definition at line 78 of file QweakSimShieldingWallMessenger.hh. Definition at line 81 of file QweakSimShieldingWallMessenger.hh. Definition at line 87 of file QweakSimShieldingWallMessenger.hh. Definition at line 90 of file QweakSimShieldingWallMessenger.hh. Definition at line 93 of file QweakSimShieldingWallMessenger.hh. Referenced by QweakSimShieldingWallMessenger(), and SetNewValue(). Definition at line 69 of file QweakSimShieldingWallMessenger.hh. Definition at line 83 of file QweakSimShieldingWallMessenger.hh. Definition at line 77 of file QweakSimShieldingWallMessenger.hh. Definition at line 80 of file QweakSimShieldingWallMessenger.hh. Definition at line 86 of file QweakSimShieldingWallMessenger.hh. Definition at line 89 of file QweakSimShieldingWallMessenger.hh. Definition at line 92 of file QweakSimShieldingWallMessenger.hh. Definition at line 73 of file QweakSimShieldingWallMessenger.hh.